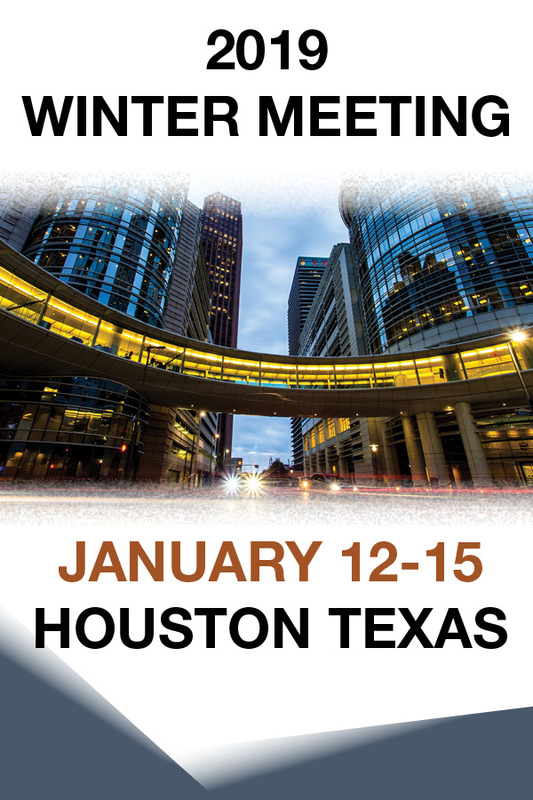 The 2019 AAPT Winter Meeting will be held in Houston, Texas, January 12-15. We invite you to attend the Meeting of the Members at the upcoming AAPT 2019 Winter Meeting in Houston on Sunday, January 13th, 8:30 PM - 10:00 PM. The location and agenda will be posted in the meeting app and on aapt.org. You’ll learn more about AAPT's programs and activities that are going on. Can’t attend the meeting? We’ll post the presentations on the AAPT website following the meeting. The AAPT Meeting App will be available soon. Please watch your email for downloading details. AAPT will be accepting abstracts for speaking and poster engagements at the 2019 AAPT Summer Meeting in Provo, Utah from January 24 to February 28. Please check the AAPT website for more information. Don’t miss out on this fantastic opportunity to present your research and share your teaching methods with other physics educators from around the globe. AAPT has secured a diverse group of awardees and plenary speakers for the Winter Meeting. Please click here for more information. The AAPT program is online. Click here for more information. Janelle M. Bailey , Heather Lewandowski , Sherry Savrda , Robert Teese , and Aaron Titus will be recognized as 2019 recipients of the Homer L. Dodge Citation for Distinguished Service to AAPT during the 2019 Winter Meeting in Houston, Texas. AAPT is seeking a K-12 Program Manager. Applications will be considered until the position is filled. Click here. Everyone needs mentors, but how do you find other women physicists who understand your experience-- as the only Hispanic in the department, the only PER researcher, the only full-time physicist at your TYC, the only one who brings a newborn in a sling to department meetings? Join eAlliances, an NSF-sponsored faculty development project for women physics faculty, and become part of a peer-mentoring alliance with other women who share many of your same experiences. This is professional development for your career stage: whether you are teaching your first or hundredth section of intro physics; mentoring your first or hundredth research associate, or leading your first or hundredth committee meeting. Someone else has a similar experience and can share insights, frustrations, and successes. Recruit STEM Interns from the Best Job Sites for FREE! The AAPT Career Center offers no-cost postings to employers recruiting seasonal interns. Locate the best fit for your organization by reaching the future of the science community - the AAPT membership, as well as the members and student members of the American Physical Society (APS Physics), AVS Science and Technology, and the Society of Physics Students and Sigma Pi Sigma. Get the word out! Your posting will also appear on the Physics Today Jobs site, which when combined with the job sites of the organizations mentioned above forms the ultimate online science, engineering, and computing career network, ensuring maximum relevant visibility for your internship. Visit https://jobs.aapt.org/employers/ to get posting! Each year AAPT sponsors a competition for high school students to represent the United States at the International Physics Olympiad Competition. The mission of the U.S. Physics Team Program is to promote and demonstrate academic excellence through preparation for and participation in the International Physics Olympiad. AAPT is responsible for recruiting, selecting and training teams each year to compete in the International Physics Olympiad Competition. Your contribution is needed to support these high school students as they prepare to represent the U.S. internationally. Donate now! 2019 AAPT PhysicsBowl Registration Open! The next Physics and Astronomy New Faculty Workshop will be held June 24-27, 2019 in College Park, MD. This NSF-funded project now reaches about 50% of the new tenure-track hires in physics and astronomy in the U.S. Department chairs are invited to nominate their new tenure-track (or equivalent) faculty members and lecturers at www.aapt.org/Conferences/newfaculty. Workshop space is limited. Preference will be given to nominations received before February 24, 2019. Click here for more information about the workshops. We appreciate our community of members, and we are here to serve you. If you have any difficulties renewing your membership or have any membership-related questions, please do not hesitate to contact us in the Membership Department at 301.209.3333 or membership@aapt.org. Beginning this month, AAPT members can take advantage of major discounts at retailers such as Hertz, Office Depot/Office Max and HotelEngine.com. You save a percentage of your bill and a portion of the proceeds helps to support AAPT as well! We will be launching the program in the coming weeks, so be sure to check the Member Discounts Program page for details. • Collaborations between U.S. and developing countries. Funding should facilitate interactions and exchanges of ideas between U.S. physics educators and/or students and those in developing countries. • International meetings and conferences focused on physics education. Meetings and conferences should involve direct contact between physics educators and furnish the interactions that stimulate new ideas and lasting collaborations. Students and faculty with limited resources can apply for funding to attend international meetings and conferences. The Jossem Fund invites applications from physics educators who are AAPT members at any academic stage or rank. Only AAPT members may apply. Awards will range from $200 to $2,000. Applications must be received by late spring or early summer (deadline is the same as the Special Projects Fund) for consideration during the 2018 fiscal year. Applications will be reviewed by the Special Projects and Philanthropy Committee. Click here for more information. Teachers and Faculty Who Have Tutored Physics? The AAPT Committee on the Interests of Senior Physicists (CISP) is considering organizing sessions or workshops on tutoring in physics and astronomy. We think that such sessions would be of particular interest to physics teachers looking for post-retirement occupations. Do you know a teacher or faculty member who has tutored physics at any level? If so, please send their names and email addresses to Charlie Holbrow, Chair of CISP (chholbrow@gmail.com). CISP would like to get in contact with them and learn about their experiences and explore how we might share these with interested colleagues. The possibilities for tutoring online either on your own or through some online agency are of particular interest, but there are useful things to say about any sort of tutoring. CISP wants to gather information about all modes of tutoring physics and make the information widely available. Are you interested in the ways you can 'pay it forward'? Have thought about how you can truly impact the future? Consider supporting the next generation of physics teachers with your tax deductible donation to the AAPT New Teacher Fund. Your generosity helps to provide professional development opportunities to new, and early career educators, with a membership in AAPT. Proceeds from this fund underwrite much of the cost of membership dues and, enables us to expand our outreach efforts. Become a STEP UP 4 Women Ambassador! The AAPT Awards Committee invites nominations for all of AAPT awards, citations, and medals. We are particularly interested in nominations for AAPT Fellows and for the Homer L. Dodge Citation for Distinguished Service to AAPT. We wanted to bring to your attention that one of AAPT’s frequent collaborative organizations, the Council on Undergraduate Research (CUR) has an enhanced institutional member category. For a list of CUR’s enhanced members, please see this webpage. If you, and other faculty, administrators, and students are at a CUR enhanced member institution, your individual membership is FREE. All you need to do is to sign-up, remembering to choose the division of physics and astronomy as your “home” in CUR. CUR’s physics and astronomy division is very active, and more members would be welcome! Please refer to the Membership Tab of the CUR website https://www.cur.org hover over “Become a Member”, select the Individual Membership Online Application, and select your institution’s name from the dropdown list. A “pop up” message will announce that you have added onto the Enhanced Membership, click OK and complete the application form. Thanks for sharing this great opportunity to connect with CUR with your colleagues in physics and/or astronomy departments. Designed for those who teach introductory physics at universities, colleges and high schools. Graduate credit will be available through the University of Oregon. The US depends on an adequate supply of STEM-literate workers to fill demand for traditional STEM occupations and the growing technology-focused careers spanning virtually all job sectors. Teachers and students too often have little voice in designing solutions to close the gap between supply and demand. The Research Consortium on STEM Career Pathways wants to change that. The National Alliance for Partnerships in Equity (NAPE), the American Association of Physics Teachers, the National Association of Biology Teachers, and the Student Research Foundation have joined forces to identify strategies to close the gap between STEM supply and STEM demand. Please help us to help you and your students. If you receive a package of surveys by mail, please complete them. If you have not yet received a mailed survey package from The Research Consortium on STEM Career Pathways, please ensure you and your students are included by filling out this simple online form or emailing us at info@studentresearchfoundation.org. Visit our websites for useful information. Thank you for participating! The 2019 award recognizes the Learning Assistance Program at U of Colorado Boulder. Three of the recipients are AAPT members. The award is to recognize and honor a team or group of individuals (such as a collaboration) or, exceptionally, a single individual, who have exhibited a sustained commitment to excellence in physics education. The award, presented annually, consists of a $5,000 monetary award, a certificate citing the achievements of the group or individual, and an allowance for travel expenses to the APS April Meeting where the award is presented. The Contemporary Physics Education Project (CPEP) has established the International CPEP Award for Excellence in Teaching Contemporary Physics to recognize an educator working with high school or middle school students, who has made outstanding achievements in teaching contemporary physics topics. Contemporary physics topics include, but are not limited to, particle physics, nuclear physics, plasma physics, cosmology, fusion physics, and gravitational waves. Please see www.CPEPphysics.org for more details on these topics. Click here for more information. The Niels Bohr Library & Archives (NBLA) at the American Institute of Physics has digitized the papers of physicist and physics educator Melba Phillips. The whole collection is now accessible to the public in NBLA’s online repository here. Click here to read a brief biography of Phillips and to learn about some of the interesting items in the collection. The Careers Toolbox for Undergraduate Physics Students is a set of tools and exercises designed to help undergraduate physics students prepare to enter the science, technology, engineering, and mathematics workforce. Tools range from exploring the common job titles of physics bachelor's to preparing for interviews, and are all geared specifically for physics students. This resource is brought to you by the American Institute of Physics and the Society of Physics Students. The 4th Edition is now ready for use. My name is Brian Soash and I am Science Friday's Educator Community Leader. I wanted to reach out to you regarding our Educator Collaborative Program, which is currently accepting applications. We'd love if AAPT teachers would apply this year. As part of the program, the teachers selected will work with myself and the rest of the Science Friday team to create their own free educator resource for other educators. This resource will be published on Science Friday's Educate page where the teacher will receive author credit, a $500 honorarium for their work, professional development about education resource creation, work with a network of outstanding educators as awesome as they are, Science Friday swag, and recognition for their completion of this highly competitive program. I hope you'll consider passing this on to your educators! Applications are due Friday, January 4th. Advise your students to check out GradSchoolShopper.com, the most complete directory of graduate programs in the physical sciences. New 2019 departmental data is now available! Students headed for graduate school can use this FREE service to search by degree programs, admission deadlines, research specialties, faculty profiles, GRE requirements, and more! If your program isn’t listed, contact us to find out how to have it included. The United States' global competitiveness is at risk as the nation confronts persistent shortages of STEM teachers. More than half of all high school physics teachers lacked certification in the discipline in 2012, for example. As a result, students who are interested in STEM careers find themselves ill prepared to compete in an increasingly highly technical workforce. A new study by the American Physical Society, in collaboration with the American Chemical Society, Computing Research Association, and Mathematics Teacher Education Partnership, addresses the reasons why STEM students shy away from teaching as a career and offers ways to counter the trend. Download the full report at www.aps.org/policy/reports. During the 2018 summer, almost 800 teachers attended one of the 49 Modeling Workshops, held in 14 different states. Plans are currently being made for the 2019 season, in which we hope to have workshops in Physics (mechanics, E&M, waves, computational Modeling: Physics First, light and sound), chemistry (first and second semester), biology, physical science and workshops for middle school teachers. The workshop information will be made available in the spring on the website. are posted on the website as we receive the information. Workshops have been planned for Arizona, California, Illinois, Indiana, Maine, Massachusetts and Ohio. Workshops are scheduled for physics, chemistry, biology, middle school and physical science. Click here for details. Arizona State University has an interdisciplinary Master of Natural Science (MNS) degree in physics for high school and two-year college teachers. Courses are in summer, and the degree is founded on Modeling Instruction. Teachers in 15 western states can apply for IN-STATE tuition; the deadline is APRIL 1. For more details click here . Ask for information click here. Click here for job description. Please submit your Section Report for the AAPT Section News. To list your section meeting in the AAPT Calendar of Events, e-mail the information to mhall@aapt.org. See the Spring 2018 Section News. AAPT's eNNOUNCER is a service to members of the American Association of Physics Teachers and is produced by the AAPT Executive Office. Tell us what you think of this month's issue. Take this survey. Other stories of significance appear in our Announcements Archive and our archive of Press Releases. E-mail suggestions, news items, comments, and unsubscribe requests to: aapt-news@aapt.org. Deliverability of this publication depends on your e-mail address being current. If you have recently changed providers, jobs, or schools, please update your profile online at aapt.org as soon as possible. Adding AAPT-News@aapt.org to your address book will also help ensure that your copy is delivered to your mailbox. See our Media Kit for advertising information or email dbott@aip.org. All eNNOUNCER issues are archived and information about AAPT publications is online. Links to non-AAPT sites are intended as a service to readers interested in AAPT, physics, and education. These links do not reflect an endorsement of any content or product. Also, due to the evolving nature of websites, some external links referenced in the eNNOUNCER may expire over time. Thanks for your readership and your support of AAPT. ● Recruit STEM interns from the best job sites for FREE! ● 2019 AAPT PhysicsBowl Registration Open! ● Teachers and Faculty Who Have Tutored Physics? ● Become a STEP UP 4 Women Ambassador! Are you receiving your journals online? Subscribe to our free e-mail alerting service to receive table of contents alerts as new American Journal of Physics (AJP) and The Physics Teacher (TPT) issues are published.